(P1) At a vast dumpsite in the west of Ghana’s capital Accra, small fires burn among piles of old computers, television screens, and laptops. (P2) This is one of the biggest dumps for electronic waste in the world, and among the most polluted places on earth. (P3) Every year hundreds of thousands of tons of e-waste find their way here from Europe and North America, where they are stripped of their valuable metals. (P4) For many it’s a LUCRATIVE business in a country where nearly a quarter of people live below the POVERTY LINE. (P6) But experts warn the TOXINS present in the waste are slowing poisoning the workers, as well as spreading pollution into the soil and atmosphere. (P7) “Mercury, lead, cadmium, arsenic – these are the four most toxic substances [in the world], and these are found in e-waste residues in very large quantities,” explains Atiemo Sampson, an environmental researcher at the Ghana Atomic Energy Commission. (P8) There is little data yet on the numbers of people who have fallen ill or even died as a result of working with e-waste. (P9) But exposure to these toxins are known to cause a whole range of illnesses from cancers to heart disease to respiratory illnesses. (P11) Analysts estimate the world will produce 93 million tons of e-waste this year alone – an ever-growing volume that is the result of the DISPOSABILITY of many high-end electronic products. (P12) Much of it will find its way to a handful of e-waste dumps in Africa and Asia, rather than being RECYCLED in the country in which it was sold. (P13) Atiemo Sampson believes electronics producers have a responsibility to help clean up the mess their products helped create. (P14) “Across the world there is a growing acceptance that the producer of the equipment must bear responsibility for ‘end of life’ management,” he says. 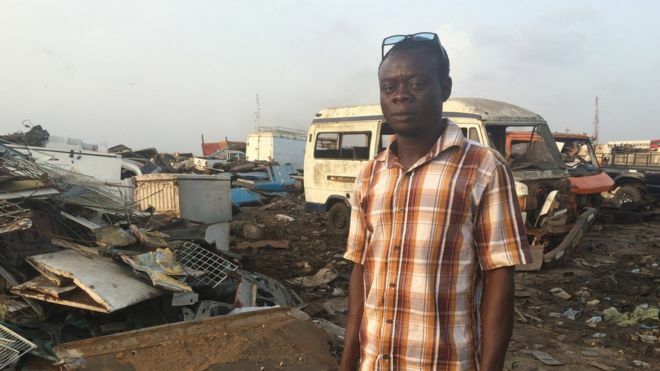 (P16) But the e-waste at sites like Agbogbloshie continues to pile up. (P17) Experts like materials scientist Hywel Jones of Sheffield Hallam University in the UK says the solution to the e-waste problem is complex. (P18) His ‘What’s In My Stuff?’ project aims to educate the public about the materials found in a typical smartphone. Since smartphones look “clean,” consumers believe they are clean – but they really are not. (P19) Jones says companies and governments need to be involved too. (P20) “Two billion mobile phones are manufactured every year – more than 15 billion manufactured since 1994, and that’s not counting cameras, laptops and televisions,” he says. How often do you replace your smartphone and other electronic devices? Are there any garbage dumps or LANDFILLS near where you live? When you have to throw away a battery, do you follow the special instructions, or do you just put it in the regular trash? Are you sensitive to toxic substances such as air pollution, or is your body very ROBUST?